Another Pinterest-inspired birthday card, this time for my daughter who is turning 11 in a couple of weeks. I used a PTI die, cut in black and coated in Crystal Effects. 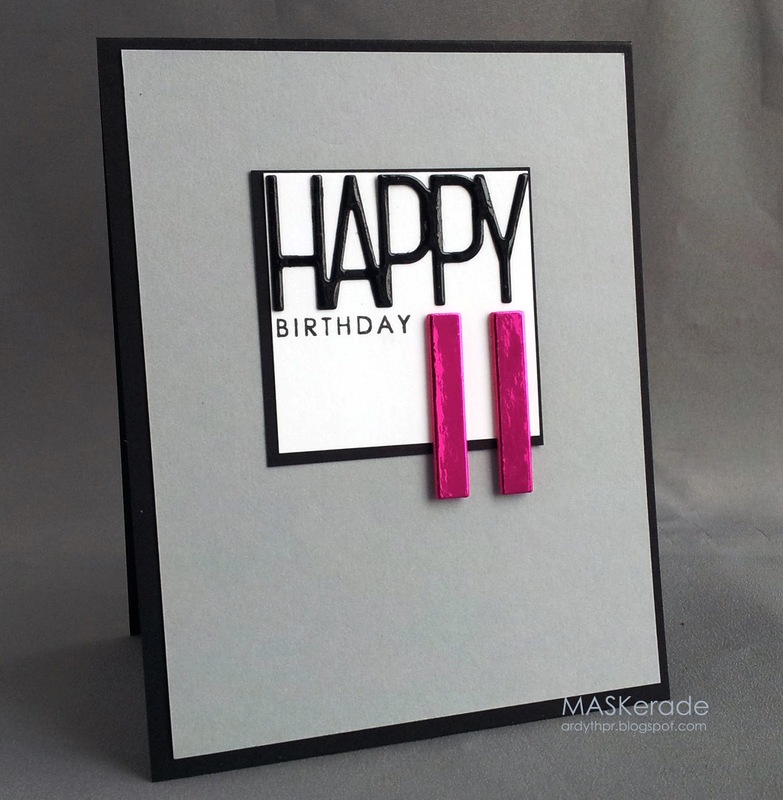 The 11 is made up of two lower-case l's from a Memory Box Alphabet set. Each 1 is 4 layers thick - 3 white and one hot-pink mirror. I used a copic marker to colour the edges of the ones so that they wouldn't be white. Very cool card! Love the shiny 11!! I need to start looking at things in an entirely different way - the Ardyth way. ;) Your daughter's card is a smash! So cool! I didn't realize it was an eleven [until I read it] duh -- I thought they were candles -- so duo duty :) -- She will love the hot pink number I am sure! Wow, love those glossy numbers and letters! Absolutely perfect for a sweet wee daughter who is turning 11. She is going to love the metallic pink! Love the depth of the numbers and love that PTI die! What a fabulous card for a Happy occasion. I really love your blog and it inspires me to start thinking about the "less is more" way of creating. Congrats! What a stunning card, so bold! Thank you Ardyth! Congrats on being a Girl Friday. Really cute card - love the colors. The bold colors are perfect with your graphic design. Fabulous birthday card. Love the bold letters. oh fabulous card love the number even though it's pink and I am not a pink gal I love it!! oh and before I forget OPI - God Save the Queens nails or a man in every Portugal tehehheheee they are fab aren't they!! [sigh] those glossy accents just make my heart happy. What a combo with the hot-pink mirror paper. This is seriously cool - way cooler than I would have appreciated at 11 but I'm guessing your kids are as cool as their mom!